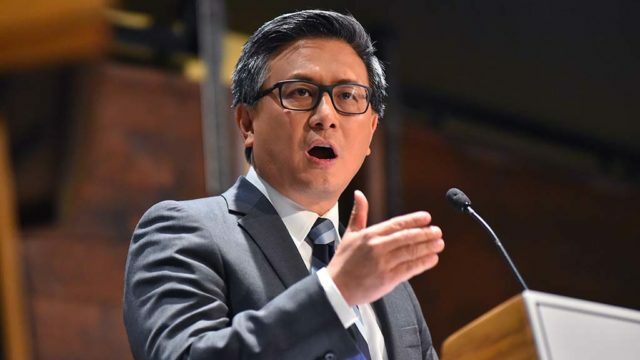 State Treasurer John Chiang visited San Diego Tuesday as part of a five-city tour to introduce CalSavers, the state’s new retirement savings program. CalSavers will serve as a state-run retirement plan for private-sector workers at companies with five employees or more. State officials boast that accounts provided by the program are portable and paid for by payroll contributions. Gov. Jerry Brown authorized the program’s implementation in 2016 and enrollment will begin in July. Program guidelines require qualifying employers to enroll their employees in the program within the next five years, but employees themselves can opt out. State officials estimate CalSavers will help roughly 7.5 million California residents save for retirement. Assemblywoman Lorena Gonzalez Fletcher from San Diego joined Chiang at the event and praised the program for its assistance of San Diego residents. State officials estimate that more than 338,000 workers are eligible to enroll in the program. The Howard Jarvis Taxpayers Association filed suit against the state in May over the program, arguing it violates federal law to establish a state-run retirement savings program. The case remains pending, but Chiang expressed confidence earlier this month that it lacks teeth.